On June 21st, 2015, the Kopernik Astronomical Society will be hosting its first annual International SUNDay event at Otsiningo Park in Binghamton, NY (http://www.gobroomecounty.com/parks/otsiningo). 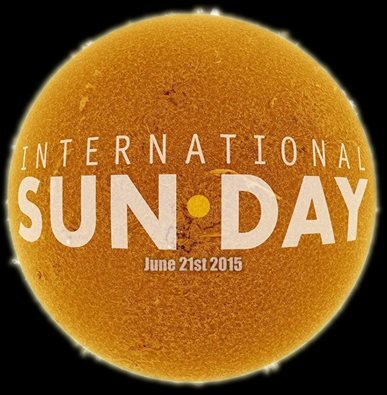 International SUNDay is an event hosted throughout the world with the goal of science outreach and teaching young and old about our nearest star. International SUNDay is supported by the Charlie Bates Solar Astronomy Project, and promoted with a free donation of safe solar observing glasses. The KAS has been given 200 of these glasses to hand out free to the general public. We will be setting up gear at the park that allows safe observations of the Sun (assuming clear skies), providing free solar observing glasses to the first 200 observers, and handing out educational information about everyone’s favorite star – the Sun. If the weather cooperates, an observer may see a sunspot, solar prominence, solar filament, and other features of the Sun using our specialized equipment. NOTE: please only observe the Sun with approved and safe solar observing techniques. Improper solar observations may cause permanent damage to your eyes or blindness. Additionally, the event occurs on the summer solstice when the Sun is at its highest point in the ecliptic plane, and also the longest daylight of any day in the year for the Northern Hemisphere. Come join us for a great time and learn something new about that giant life-supporting star in our sky.